When I first saw the Finding Dory trailer, I knew I had to see the movie. There are, of course, a million reasons that someone interested in the history and current study of the marine environment would want to see a movie about a bunch of lovable talking sea creatures. A particularly important aspect of the movie (spoilers maybe?) involves the role of public aquariums in conservation, a topic especially close to my heart. And ensconced at this public aquarium is Sigourney Weaver, also especially close to my heart (Aliens is a classic). Dory is caught in a piece of plastic from a 6-pack during part of the trailer and she is swimming through a dead zone full of tires, rusted cars, cans, and bottles in another. It is important to analyze why these images are in Finding Dory and also the impact that the portrayal of the ocean as a trash heap might have on the way that people think about the ocean. So for this first blog post, I’m going to think about the history and current status of trash talk and the ocean. In the next part of this series, I’ll talk about conceptions of the ocean as a pristine environment and the possible impacts of portraying the ocean as containing trash. I don’t find it surprising that the most noticeable piece of garbage in this trailer is the six-pack-ring. The rings were brought to the attention of the public during the earliest reports of ocean pollution. In 1988, a beach cleanup in Texas found 15,600 six pack rings in 3 hours (this was over a 300 mile span). If you were a kid in the 80s or 90s, there’s a good possibility that you were taught that you should cut up these rings before throwing them away so that if they made it out to sea they wouldn’t kill a sea turtle or bird. Images of desiccated animals caught in 6-pack-rings were used fairly regularly during the 80s to galvanize a public to clean up their act. While the emphasis on these plastics has been largely misplaced, the majority of debris in the ocean is not from six pack rings, it is still a highly recognizable form of pollution and presents a visceral message to those of us who grew up during this period. This is a picture of Peanut. 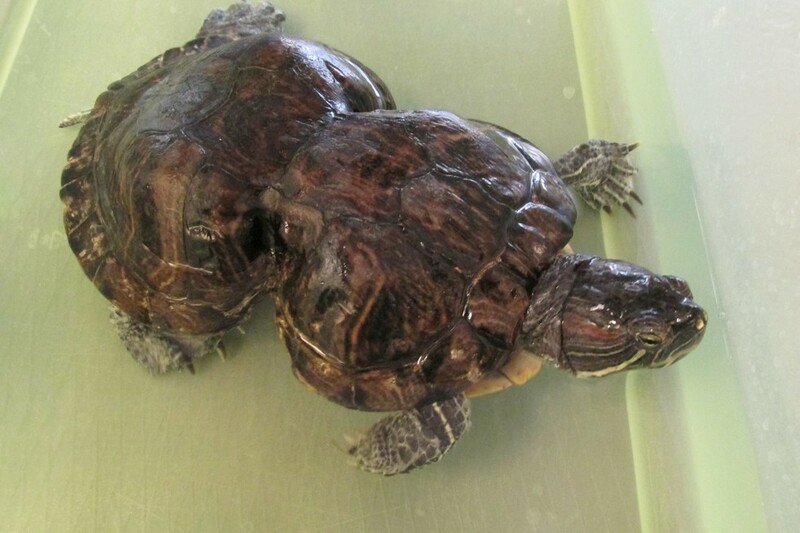 A red-eared slider in Missouri that must have slipped into a six pack ring when she was born in the 1980s. Found in 1993, she was cut free and is now used for wildlife conservation education. She's still alive and living in Missouri. Obviously not a sea turtle, but you get the point. The other visual in the trailer is that of Dory swimming through a wasteland of sunken ships, cars, bottles, tins, and tires. I think the ships are something we have come to expect and associate with the ocean- in some sense shipwrecks have become naturalized and normalized when we imagine the underwater environment (more on this in the next post). But there is something jarring about the cars and tires, even though we shouldn’t be particularly surprised that they are so common on the ocean bottom that they exist even in animation. In 1972, officials in Fort Lauderdale, Florida proposed a “tire reef”. The Reef would be built out of used tires- deemed an eyesore on land but perfect for the building of artificial reefs. The proposal suggested a win-win. The reef would get rid of ugly trash constructively (instead of just chucking it into the ocean while no one was looking) and bring more game fishes into the area for anglers and tourists (they were rapidly diminishing: read about it here). Tire reefs had already been initiated in Indonesia, Malaysia, Africa, Australia, and the American Northwest (against better judgement and advice from experts) and the South Floridians were super excited. So yeah. In what I think you can imagine was a pretty bad idea, Broward county, with the help of Goodyear and the Army Corps of Engineers, dumped over 2 million tires over 36 acres about 7000 feet off the coast in 35 feet of water. The tires were tethered together at the time and anchored on concrete slabs. This became known as the Osborne Artificial Reef. A barge dumping tires onto the Osborne Reef. It didn’t work out so well. While some coral grew on the tires, the tethers quickly eroded because of the salinity of the water and tires began drifting. They damaged previously healthy reef structures. Each subsequent hurricane pushed tires onto healthy reefs and further up and down the coastline. Tires from the reef have washed up on the Florida Panhandle and as far north as North Carolina. In 2001, a biologist at NOVA Southeastern began a project to remove the tires but it wasn’t until 2002 that government support began to remove most of the tires. The Army began removing the tires, combining the conservation initiative with dive training exercises. However, as of 2015, the state and federal budget only encompasses the time and manpower to remove 160,000 tires, leaving almost 40,000 to float freely off the coast of Fort Lauderdale. The Osborne Reef wasn’t the only tire reef to fail- all tire reefs have come to naught. The Osborne reef today. Clean up is going slowly. In truth though, neither six pack rings nor tires are the biggest threat to the marine environment. In fact, even though images from the great pacific garbage patch and recent reports of trash littering Chinese beaches have called attention to the issue of pollution in the ocean, it is the plastic that we can’t see that has recently been identified as a danger to marine health. Microplastics are just what they sound like: minute pieces of plastic that are either the product of plastic that has degraded and been broken down over time or small plastics like microbeads used in beauty products and other industrial products. These plastics are nearly invisible to humans but they taste, look, or feel (depending on how the organism senses) like food to many organisms, especially gelatinous zooplankton. While it would be bad to have an ocean full of jellyfish full of plastic, this probably doesn’t sound horrible to you. What’s a few jellyfish in the grand scheme of things? But here’s the thing- if plastic is the daily special for the lowest organisms on the food chain, it will eventually be the inadvertent consumable of those highest on the food chain (that’s us). Little fish eat jellyfish and bigger fish eat them and so on and so forth until humans eat the biggest fish because we like those predator fish so very much. And before you know it, we don’t just have to worry about mercury in our tuna, but also plastics with a wide range of chemicals. 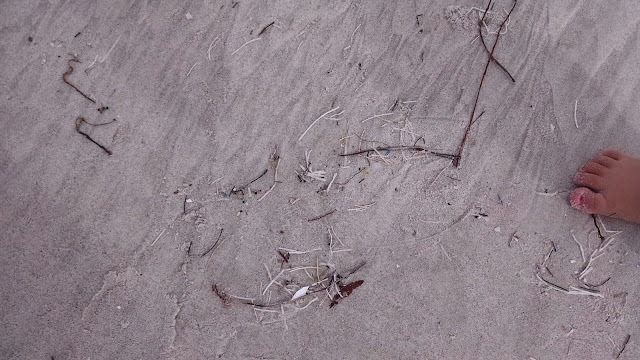 The ocean is full of these microplastics. 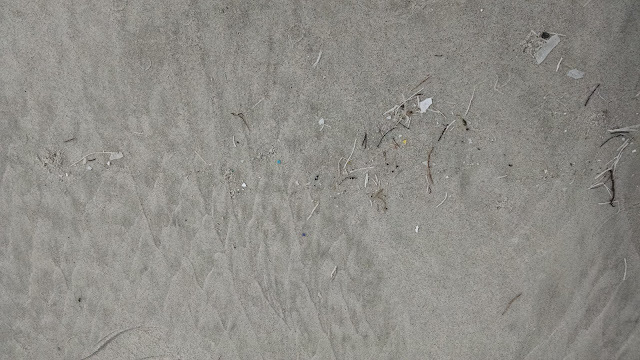 I’ve been reading about microplastics for a while now but still I was startled after a storm in Florida to walk on the beach and encounter a clear line of microplastics along the shoreline. I had gone to the beach with a trash bag to pick up what I knew would be a huge amount of trash kicked up by a heavy surf (even I was surprised by the amount and range of trash I picked up). But there it is: a tiny, colorful line in the sand. 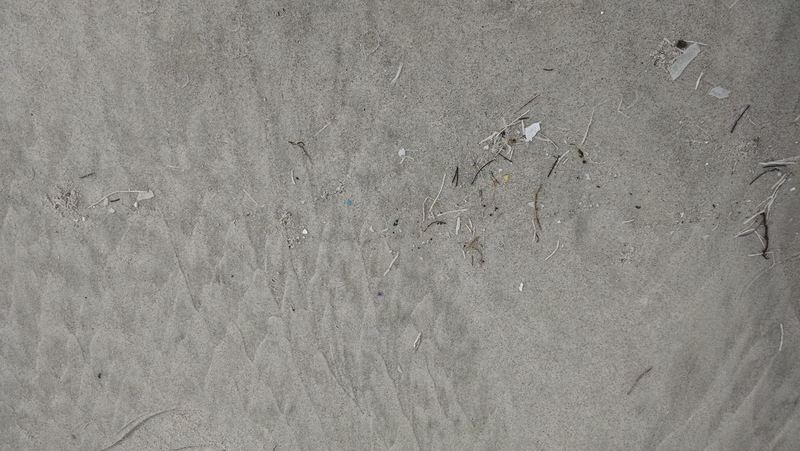 You can just see the microplastics of different colors on the tide line. 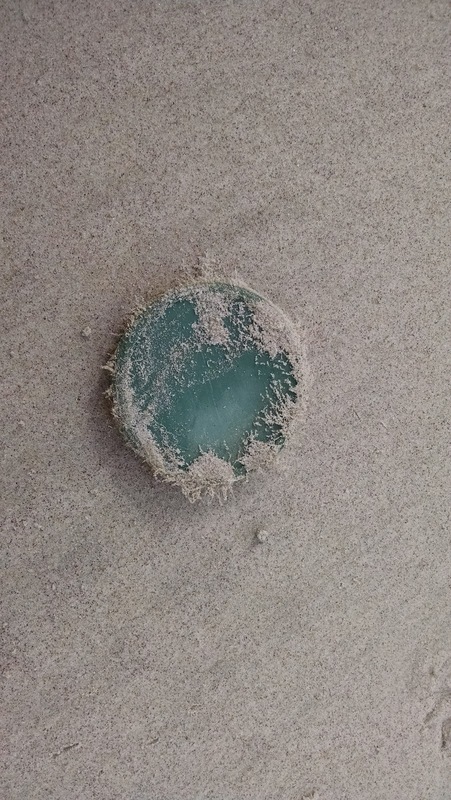 This is a bottle cap found on the beach. 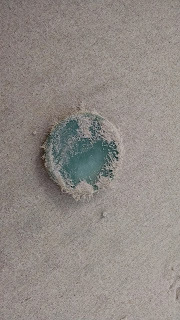 It is ringed with algae and blends into the beach. If you weren't looking for plastic, you would think that it was a jellyfish or a beautiful shell. And it turns out that ingestion is not the only fear where microplastics are concerned. While tires might not be the best way to start coral reefs, it turns out that microplastics are a pretty awesome place to build microbiomes. Microbiomes, conveniently named the “plastisphere” by researcher to identify the newly created environments surrounding these floating plastic trash heaps, are communities of microbes that build up on these microplastics. When I initially heard about this new area of study, I was initially optimistic. Wouldn’t it be great if these plastics could host great little floating communities? Alas, no. It appears that these microbiomes are a cause for concern because they could serve as particularly crafty vectors to move viruses and bacteria across the ocean relatively easily. So what does all this plastic talk mean? The ocean has a big plastic problem- humans have created a whole new ecosystem and handily named it. We did that. But the type of conservation we are still talking about, the type of plastic pollution we are still supposed to be fighting are the concerns of the 70s, 80s, and 90s kids. Of course, it isn’t wrong to worry about six-pack-rings and tires, but the major problem is something huger than these individual pieces of plastic. It felt like nostalgia, watching these animated moments even though I was startled that they appeared at all. There is no solution to the plastisphere problem at the moment, technologies and strategies like those proposed by The Ocean Cleanup are still in developmental phase and fail to take into account the multiple variables required to pull-off such a large project. As of now, smaller projects to remove the plastic are here to stay. So focus needs to be on preventing more plastic from entering the ocean. This is where films like Finding Dory come in. It is clear that the animators, writers, and directors were hoping to make some statement with these images. Portraying the ocean as a beautiful place being trashed seems like an important step towards teaching children stewardship. However, I wonder how the inclusion of trash without actually pointing out how wrong it is, how harmful it is, might actually go to naturalize or normalize these images for younger children. The question of how to raise good stewards, and whether these types of images work, is for the next post.